The answer: a mutation appears in the RNA first. The mutation in the RNA results in a protein with augmented function that helps the cells grow, giving them a chance to replicate their DNA and for subsequent DNA mutations to exert their effects. 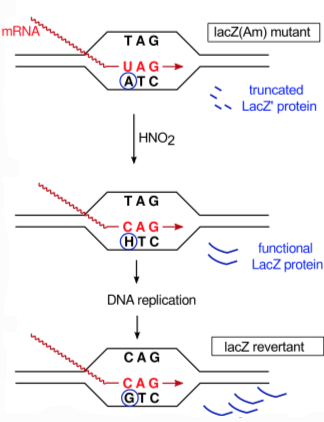 Note: despite retromutagenesis’ name, reverse transcriptase is not involved. In the PLOS Genetics paper, scientists led by Doetsch and colleague Bernard Weiss, MD provide evidence that retromutagenesis is occurring inÂ E. coliÂ bacteria forced to grow on the sugar lactose as their only source of energy. The bacterial strain tested had a disabling mutation in a gene that, if functional, would allow the cells to use lactose. When exposed to high levels of nitrous acid, a DNA-damaging agent, mutations appeared in the bacteria and some of the bacteria could grow. By analyzing where exactly on the DNA the mutations occurred, the scientists concluded that retromutagenesis was contributing to bacterial growth. “Most of the previous experiments on adaptive mutation have attempted to rule out growth of the parent cells during selection, which is almost impossible to do with the necessary rigorâ€¦ Instead of measuring overall DNA replication via cellular growth in the parental population during selection as in previously published experiments, we are able to gauge DNA replication specifically in the revertants via NTS [non-transcribed strand] mutations. Low frequency of NTS mutations found after direct selection indicates there was little DNA synthesis before gene expression and strongly supports the model of retromutagenesis,” the authors write. The authors note that retromutagenesis may explain previous observations of bacteria developing resistance to the antibiotic ciprofloxacin, as well as mutations in the human Ras oncogene, seen in many forms of cancer. The research was supported by the National Institute of Environmental Health Sciences (P01-ES011163).